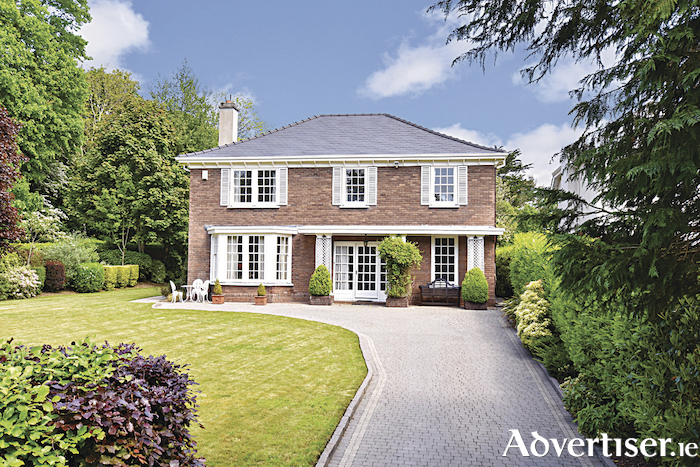 Averarde, Taylor’s Hill, is without doubt one of Galway’s finest residential properties. Set in glorious mature gardens on a large exclusive and private site, this imposing residence enjoys a stunning location, tucked away off Taylor's Hill Road, within a short walk of the city centre, Salthill and all amenities, including primary and post primary schools, shops, bars, restaurants, coffee shops and numerous sporting clubs, including Galway Golf Club and Galway Lawn Tennis Club. The residence, which was built by O’Malley Construction for the current owners, has been well maintained and is presented in excellent decorative order. The accommodation extends to approximately 3,000 square feet and comprises a large entrance hall with feature staircase leading to the first floor. Off the hall to the left are two elegant interconnecting reception rooms of generous proportions, enhanced by high ceilings, decorative cornicing and an exquisite feature fireplace, combining the formal living and dining rooms. On the opposite side of the hall is a study, separate cloakroom and shower room. To the rear of the house is the kitchen which is well fitted with a range of oak wall and floor units and a range of integrated appliances. A rear lobby leads to a wonderful living room which enjoys a dual aspect overlooking the gardens. Other accommodation on the ground floor includes a utility. Upstairs, there are five bedrooms (master en-suite ) and a main bathroom. The property is accessed from Taylor's Hill Road via a private avenue which leads to the front driveway. The gardens enjoy complete privacy and are bordered by brick walls and hedging, all of which contain superb manicured lawns to the front and rear with a variety of mature trees and shrubs providing an abundance of colour. The property boasts a truly enviable location on this leafy and most desirable road. Both the city centre and Salthill, as well as UHG and NUIG are within walking distance, with a host of primary and post primary schools all within close proximity, as well as an abundance of shops, eateries, coffee shops and bars. The sale of this property represents a once in a lifetime opportunity to acquire one of Galway’s finest homes situated on a stunning exclusive site and viewing is highly recommended. Page generated in 0.0870 seconds.